EL CAJON (3-11-16) — In Warhawk Classic action the Christian Patriots defeated the Coronado Islanders 11-6 in El Cajon, Thursday (Mar.10). The Patriots were able to get on the board first thanks to scoring 3 runs in the first inning on a leadoff double by SILENT RAIN ESPINOZA (3-4, 2B, 3R) who would come in on a single by ASHLEY CARTER (3-4, RBI, R, SB). They would lead 3-0. Christian tacked on a run in the bottom of the second to lead 4-0. Coronado got on the board as they scored five runs to take a 5-4 lead in the top of the third inning. However that lead would be erased in the bottom of the fourth as Christian would tack on five runs to lead 9-5. The big damage was done by ANNA SHERBURNE (3-4, 3R HR, 4 RBI, 2R) as she blasted a 3-run homer. Christian added a couple more runs in the bottom of the fifth to round out their final score. GRANITE HILLS 8, SOUTHWEST EL CENTRO 6 – The Granite Hills Eagles looked to get into the win column against Southwest El Centro on Thursday (Mar.10th) and were able to as they grabbed the 8-6 come from behind victory in the Cougar Classic. In the top of the third the Eagles of Southwest would strike first as they scored two runs to take a 2-0 lead. They would score four more times in the top of the fourth to lead 6-0. Despite being down the offense of Granite Hills came alive as they were able to score three runs. KAYLA MACK (2-3, RBI, 2B), JESSIE LAPIERRE (run) and RILEY JO AGERBEEK who drove in a run would also score to cut into the Southwest lead at 6-3. In the bottom of the fifth, Granite Hills cut into the deficit even more as HALLE KYLER (2-4, HR, 3B, 4 RBI) banged a 2-out triple and scored on the very next play as Mack rocketed a double to make it 6-4. Down to their final inning of at bats, Granite Hills looked to keep things going offensively. Leadoff hitter SYDNEY HUSE singled, MADISON CALDWELL singled, and the next two batters would be retired. So now with two outs it would be up to speedster KAREN CREECH to keep things going and she would succeed as she laced a single that scored Husem, which now put them within one run at 6-5. Everyone in the crowd was on pins and needles in anticipation as to what would happen next. Up stepped Kyler who had tripled in her previous at bat. The first couple of pitches went her way as she was able to work it to 2-0. On the very next pitch she bombed it high and over the fence for the game winning 3-run dinger which brought the Granite faithful to a loud roar and all her teammates out of the dugout to greet her at the plate where she would cross the plate to complete the dramatic comeback and also give Coach CURTIS BARNES his first victory as varsity coach. GROSSMONT 9, VALLEY CENTER 0 – In Cougar Classic action at Kit Carson Park the Grossmont Foothillers were able to get the shutout against the Valley Center Jaguars 9-0 in Thursday’s (Mar. 10) contest. Grossmont in the first inning thanks to their speedsters at the top of the lineup were able to plate a couple of runs to lead 2-0. CHLOE CAMARERO (3-3, 3 R, 2 SB) singled as did DESTINY BACON (3-3, 3 R, 2 SB). Camarero would score on a groundout by SAMARIA ROOPE and Bacon would score on a single by MADDIE LINDSAY (2-3, RBI, 2B). More of the same would occur for the Foothillers in the third inning as they would score four more runs on six hits to lead 6-0. Camarero, Bacon, Roope and Lindsay all would score in the inning. They tacked on three more runs in the fourth inning to round out their scoring Camarero and Bacon scored as well as LILI FLORES. WEST HILLS 9, CARLSBAD 5 – The West Hills Wolf Pack took on another top program in the county as part of their tough schedule in Carlsbad as part of the Cougar Classic and came away with the 9-5 victory. It looked like early on that they would again fall short as the Lancers jumped out to a 3-0 lead on a 3-run blast in the top of the first inning. However the Pack was determined as they answered with a three run inning of their own to knot the score at 3-3. Leadoff hitter BROOKE ROBERTS singled, SIERRA SCHLICTING singled and KENDALL MARINESI (1-3, 2 R, RBI) reached on a fielder’s choice. The next batter ALEX GUAY (2-3, HR, R, 4 RBI) roped a 2-run double and PAIGE BOWLER (2-2, HR, R, 3 RBI) tied the score with a sacrifice fly to left. In the second inning the Pack was able to push across four more runs which would give them a 7-3 lead which they wouldn’t relinquish. The Lancers would score in the third via a solo homer and would tack on their final run in the fourth inning. West Hills in their half of the fourth inning added to their lead with 2 outs. Back to back jacks by Guay and Bowler put the Pack more on the board. It would be Guay’s first of the year and for Bowler her third on the season. PATRICK HENRY 4, MISSION HILLS 3 – The Patrick Henry Patriots took on the Mission Hills Grizzlies in Cougar Classic action Thursday (Mar. 10) and had to work magic for the dramatic 4-3 victory. Mission Hills who was coming off being beaten 14-0 by West Hills looked early on like they were going to pull off the big upset of the early season. In the top of the second inning they were able to get to Henry ace MADISON JAMES and push across three runs to take an early 3-0 lead. The Patriots thanks to SAVANNAH CHAPMAN reaching on a fielder’s choice and scoring on a passed ball that would cut the Grizzlies lead to 3-1. The score would remain the same in favor of the Grizzlies as both teams would go back and forth until the bottom of the seventh inning. Things didn’t look good for the Patriots in the bottom of the seventh as leadoff hitter Chapman would fly out and the next batter ANYA VANDERSIP would strikeout. With the Patriots staring down the barrel of defeat at the hands of a non-ranked opponent all of sudden the tables turned. The next two batters ANDREA WRIGHT (run) and TATYANA GUERRERO (run) each drew a walk giving the Patriots life. Now with runners on first and second with 2 down, up stepped MADISON JAMES (3 RBI, HR) to the plate. She was able to work the count in her favor at 2-1. On the very next pitch she was able to get hold of it and club it high and over the right center field fence for the very dramatic game winning bomb. RAMONA 5, STEELE CANYON 2 – The Steele Canyon Cougars took on the Ramona Bulldogs in Cougar Classic play and came out on the short end of a 5-2 contest. Ramona would score their first two runs in the top of the second inning to take an early 2-0 lead. They would score another in the third to lead 3-0. Steele Canyon finally was able to get on the board thanks to a leadoff single by MAKAYLA STROMENGER who would come around thanks to a ripped double by JJ VENZOR. The Cougars would get as close as a run as they cut the lead to 3-2 thanks to a run in the bottom of the sixth thanks to AUDREY BAGGE who singled and would come around to score. Unfortunately the Bulldogs would extend their lead with a couple of runs in the top of the seventh and the Cougars would go down in order in the bottom half. SERRA 6, SAN DIEGO 1 – The Serra Conquistadors took on the San Diego High Cavers in the Monte Vista Classic and were able to get the 6-1 road victory, Thursday (Mar. 10th). The Conquistadors would get on the scoreboard in the top of the second inning thanks to MEGAN POOLE (2-4, 2 RBI, R) reaching on an error and later scoring thanks to a wild pitch to give Serra a 1-0 lead. They would add to their lead in the third thanks to a HBP by DARBY TIBBETTS, BRIANNA CORONADO would come in as a courtesy runner. She would later score on a single by AMBER WOZNIAK (1-3, RBI) to make it 2-0. The Cavers would cut the lead in half thanks to a run in the bottom of the sixth inning to make it 2-1. However the Conquistadors would in the seventh inning plate four runs to extend their lead to the final score. UNIVERSITY CITY 6, EL CAPITAN 3 – The El Capitan Vaqueros headed out on the road and took on University City in the Monte Vista Classic and unfortunately run output couldn’t match the slugging output in the 6-3 defeat. University City thanks to 5 runs in the first couple of innings led 5-0. They would add another run in the bottom of the fourth to lead 6-0. However the Vaqueros in the fifth were able to push a run across thanks to an RBI single by NICOLE VACARRO (RBI) that scored GRACE BURKETT (run). The Vaqueros in the top of the sixth inning were able to cut more into the Cavers lead thanks to both SHALYA SCHOONARD and ZANDRA RANGALE who came around to score but unfortunately that was all El Capitan would get as Burkett was retired. ESCONDIDO 6, SANTANA 0 – The Santana Sultans took on the host Escondido Cougars in the Cougar Classic and couldn’t get the bats going in a 6-0 loss. Santana who was coming off a dramatic 4-1 victory the other night were limited to only one hit on the evening by Escondido pitching. The lone hit came in the top of the first inning as leadoff hitter MADDY MENDEZ who laced a single. 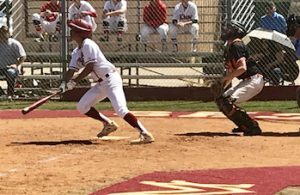 MONTGOMERY 11, MONTE VISTA 7 – In Monte Vista Classic action on Thursday (Mar.10th) the Monarchs dropped an 11-7 decision on the road to the Montgomery Aztecs. Junior GENNA HENDERSON went 2-for-3 with a pair of RBI for the Monarchs, but an eight-run first would prove enough for the Aztecs. MARIAH WHITEHEAD added two hits for Monte Vista. OUR LADY OF PEACE 15, HELIX 9 – The Helix Highlanders hosted the OLP Pilots in the Madison Warhawk Classic on Thursday (Mar. 10th) and couldn’t muster enough offense in a 15-9 loss. Senior DESTINI BULLOCK homered as part of a 2-for-3 performance with three runs and four RBI for the Highlanders, while senior VICTORIA CYMAN was 3-for-4 with two runs scored. GABRIELA OLIVERRIA drove in three runs for Helix, which led 2-0 after one, but the Pilots had four in the second and nine in the third.